When I first came to BATL (then known as ATL), my first impression was of how the people on this forum were so extremely helpful and patient with a dolt like myself. I was used to nasty support boards where RTFM was a common response to folks seeking assistance. I've been here regularly for over 4 years now. I've never seen anyone lose patience or treat another poster with disdain or snobbishness. That's impressive! Do any of you know why it's like that here? I can tell you... his name was Bruno. He was always the guiding light in this area of Scot's Newsletter Forums; and his guidance spilled over into the rest of this place, making it a wholesome, friendly learning environment. His vision was of a place where NO ONE should be afraid to ask even the simplest question, where NO ONE would ever be criticized for the choices of operating systems or applications, where NO ONE would fear being teased or demeaned. In other words, a safe haven for those seeking knowledge and friendship. We, in order to carry on Bruno's vision, must remember these things. We MUST remember what this place is all about. We must remember that we set an example for others. We must continue to be helpful, kind, considerate of others' choices and methods. We must remember that this forum is about Linux, all things thereof. We each have our favorites. We each have our own ways of doing things. We must respect the choices and methods of others. Even Bruno had his opinions about things. He knew that to maintain the environment most conducive to learning and assistance, he had to keep his opinions to himself at times. We want NO fanboys here at BATL. We want NO snobbish egg heads looking down upon less knowledgeable members. We will tolerate NO ill treatment of other members anywhere at Scot's. When you log back in the next time, remember Bruno's dream. Try to keep BATL the place that I found it to be back when I first came here. Were it not for Bruno and many of you still out here, I would never have learned the things I have nor accomplished the things that I did. 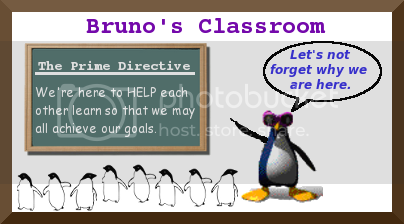 A new Linux Explorer needs to know that our PRIME DIRECTIVE here at Bruno's All Things Linux is to assist them to learn and gain the knowledge they seek to accomplish their own goals in Linux. That's what it's all about, folks. Let's not forget. Bruno, I never met you but you've done an amazing thing here. Thanks for creating it and nurturing it to the point where it remains even after you depart. I'm sorry I never got to know you personally, but I know you through your legacy. So true.I miss Bruno a lot.We still got you Eric and Paul, Urmie, Josh (thanks Urmie for the comic relief) and all the others here that were touched by Bruno.Great community, I'm proud to be a part of it. Edited by Frank Golden, 06 November 2010 - 03:12 AM. So true!! I would not be where I am today, as far as Linux is concerned, if I did not receive the help and guidance that he provided over the years. Bruno and others taught me the whole ideal of giving back to the community. Since that time I have always tried help others as much as I could and enjoyed it greatly. I consider Bruno to be a great friend, teacher, and Guru. You will be forever missed! !Thank you for EVERYTHING Le Professeur Pingouin!!! It brings back fond memories seeing the 'dancing' penguin. Imo there's only one safe community place on the internet to go and ask questions, a place where you can ask almost anything without getting dumbed down, harassed, or whatever. The only place where one comes back to, just because one feels at home, and above all that safe.A place where you don't will be left hanging around with your question unanswered, your problem unsolved or at the least not helped to get you in the right direction. A harbor I would say. A place where you don't get treated and marked or stamped with that dreaded word Bruno would never, ever use and we all know off: we once were all new explorers and had to learn, you know which word I mean. If that's not enough, try it: if it has to be, people even skip a part of their nights rest just to help someone, I've seen that happen more then once.What more can I say except this: a place where friends meet friends. And it doesn't matter whether you're using Mac OS, Windows or Linux or whatever flavor. I think that's a unique place on the net nowadays. Let's try and keep it that way, Bruno showed us how to accomplish that. As one who was told to RTFM (honestly, I didn't know what that meant until last winter!) several times in my first week of trying Linux, I was ecstatic to be sent here (thank you Eric). I asked a lot of what I thought were stupid questions over the past 4 years but never once was I made to feel small for it. Not only Bruno, but everyone here has been so patient and helpful. I'm sure there were times when I may have caused one or two to come close to pulling out their hair with my slowness in understanding,LOL, but you stuck with me until my AHA! moments happened.Thank you all! A life? Cool! Where can I download one of those? Hear Hear! I read recently that one is not truly gone till everyone who remembers you is gone (was it your words, Eric?). Bruno will be here for a long time to come. Edited by sunrat, 06 November 2010 - 09:07 AM. Great tribute to Bruno, Eric.Had it not been for Bruno's encouragement and endless supply of patience and the other great people here at Scot's, I would never have had the courage to actually install linux on a computer! Previously, the most I had hoped for was to run a live CD and just use the distro to browse because I knew Firefox. To actually install it, and use it for burning disks and other tasks I relied on windows for was really scary to me. Great post Eric.Thank you and everyone else for the reminders. Great post Eric! Bruno's strength of character was something amazing. He provided the steady hand to the forum, yet was so flexible in his dealing with each individual. One thing I always admired was his ability to detect a persons knowledge level and explain things based on their understanding...at the same time expanding their level( in my case, he had his work cut out for him) I miss him as a mentor and a friend.In my mind, each of us(admins, mods, and members) have a piece of Bruno in them, it reflects individually in our different styles and methods, those pieces combine in the forum, then collectively reflects Bruno's full character and fulfills the Prime Directive. This is soooo true! Bruno is greatly missed!And we are ever so thankful to have such great Mods/Senior Mods/Admins in BATL to take up his mantle and do all they can to uphold Bruno's legacy here! :thumbup:For those that are new to BATL, you might like to read a page on Bruno at my blog:Bruno...remembering a dear friendThere are links and clips from various tributes to Bruno from elsewhere on the Web too including Eric's, Corrine's, Ron's, Jeber's and Ken/Helio's tributes. If I have missed anyone's please let me know so I can add it in.I think it is important to have a listing of them all here on BATL. As I have only just started my journey into Linux just last month, I thought I would put my thoughts down as I know many of you were in my shoes and found a safe haven to learn this new OS here in Scot's BATL. As I never seem to do things spontanously I spent much time reading and finding out what this Linux thing was all about. Learning about "Open Source", learning that there was a community that believes in the better of all users instead of the better of the Monopoly company. As a contributor on Major Geeks, I have thoroughly enjoyed the opportunity to help people with their Windows problems as well as learn many things myself. I believe it was there, that I found the link to Scot's Newsletter. WOW!!!!! As I had only just a few days prior installed my first Linux distro (Mandriva 2010.0 KDE Duel booting with Win XP Pro) that I found BATL and even better Bruno's tutorials. Through Bruno's lessons as well as others on here, I have already learned a lot and feel VERY comfortable posting with all of you because of how you instantly make a new member of your site feel at home. So with that.....I thank you very much. I expect to be (or would LIKE to be) in a few years, where many of you are now, helping the new guy or gal who has decided to take a chance and jump in with both feet to the world of Linux. Edited by ichase, 09 November 2010 - 12:47 PM. "I'm in repair.............I'm not together, but I'm getting there"
bruno indeed did a lot here, quite a lot, both in his life, and in his passing.yet there are scores of ppl here who are helpful and courteous, let's not forget those folks. Through Bruno's lessons as well as others on here, I have already learned a lot and feel VERY comfortable posting with all of you because of how you instantly make a new member of your site feel at home. So with that.....I thank you very much. I am not forgetting about everyone else, hense I mentioned that in my post (quote from my post above). I certainly hope anyone here who has provided me guidance does not feel unappreciated as I try to make sure I thank each and everyone that does. And I think most of them were attracted to this forum initially by Bruno and the culture he encouraged here. I'm sorry I didn't see this thread sooner. I don't get to stop by as often as I used to, but I try to drop in as often as I can, and while I'm grateful for all the good people who are still posting at BATL, I miss Bruno every time I'm here. Edited by ebrke, 26 November 2010 - 07:27 PM. Yes, so true. Bruno is a tough act to follow! :yes:But I totally understand the sentiments ... everyone does try to do the best they can to be a good steward of Bruno's Legacy here. Right on, Eric! Thanks, you guys. This is where I got my start and Bruno was the teacher (no offense to Teacher). I do remember Bruno and Teacher having a friendly back and forth over LFS vs. Gentoo. That only served to promote members to try both. Bruno was always trying to get people to push their knowledge and experience and we're all better for it. He tirelessly helped prospective users through advanced users. This is the place to overcome your fears about switching and the place to find out that it doesn't have to be one or the other. We can appreciate all Operating Systems here, emphasis on Linux. This place is what all user forums should be like. People helping people...just because it is the right thing to do.